both of whom are present today. Variations on "Ich bin der schneider Kakadu"
Throughout his life Beethoven found popular operas a rich source of themes for variations. The song "Ich bin der Schneider Kakadu" (I am the tailor Cockatoo) comes from a comic opera by Wenzel Muller, a popular opera composer. It is believed that Beethoven started work on these variations as early as 1803. He wrote to his publishers in 1816, describing the set as "one of my earlier compositions, but nonetheless not to be reckoned among those to be rejected". After a number of revisions, the variations were finally published in 1824. The work begins with a slow introduction which builds grandly into the first statement of the "Kakadu" theme. The ten variations that follow are delightful miniatures using combinations, for example No 1 is for piano alone, No 2 and No 7 are for strings only and No 3 for cello and piano. No 9 is an Adagio espressivo in the minor key, followed by a coda with fugue based on a fragment of the "Kakadu" theme. A final variation in the major mode rounds off the set. John Psathas studied both piano and composition at Victoria University before continuing his studies in Belgium. Now an Associate Professor of Composition at Victoria University, he is one of New Zealand's most frequently performed composers, with a high international profile. His music has been championed by top muscians such as Evelyn Glennie and the Nederlands Blazers Ensemble. In 2004 he was awarded an Artist Laureate Award by the Arts Foundation of New Zealand and was commissioned to compose the music for the opening and closing ceremonies of the Athens Olympics. His 2006 CD "View from Olympus" was top of the New Zealand classical charts for over two months. About Helix, the composer says that although the movements are very different they are all part of the same process of discovery - "when I write music, it's not a sense of inventing I experience, as much as it is a sense of finding something that exists at the remote periphery of what I know". Together with the youthful Octet, the two late Piano Trios are often regarded as Mendelssohn's finest achievements in chamber music. 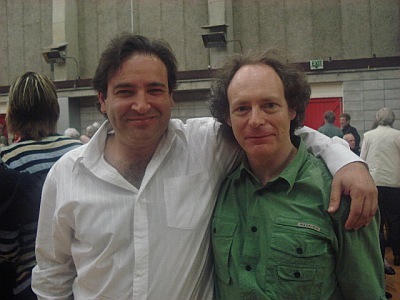 Trio No 2 was completed during the 1845 season at the Leipzig Gewandhaus, where Mendelssohn, as principal conductor, was obliged to direct concerts as well as numerous rehearsals. The Trio demands a virtuoso pianist, yet its string parts are more substantial and better integrated than was usual for Mendelssohn's day. Rather than the piano part dominating, the three instruments engage throughout in a complex and balanced dialogue. The opening movement is in a fiery mood, a mood mostly contained but releasing its rhythmic energy in brief outbursts. The Andante features a simple rustic melody although it too reaches a surprising degree of intensity. Like most of mendelssohn's greatest works, the trio contains a light, fleeting Scherzo, a genre at which he was particularly adept. The finale is introduced with a furious rhythmic excitement, surprisingly climaxing with a triumphant hymn-like Chorale, perhaps intended to give a sense of spiritual purpose to what might otherwise appear simple entertainment. THE NEW ZEALAND TRIO comprises three outstanding artists, all firmly established successful musicians. In 2004 they took up residency at the University of Auckland where in addition to a heavy performing schedule, they all teach and hold master classes. Increasingly hailed for their innovative repertoire and dynamic interpretations, the New Zealand Trio have become important ambassadors on the international stage for New Zealand and New Zealand music. Over the past two years they have completed a number of international tours, earning high praise from audiences in Brazil, United States, Europe and Asia.